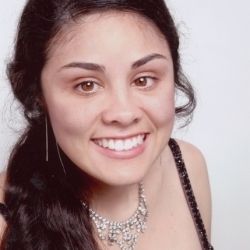 Jessica Victoria (Bachicha) Ewell, who earned her doctorate in vocal performance in 2011, has accomplished many things since graduation. A classically trained vocalist, Ewell is an assistant professor of sacred music at the Franciscan University of Steubenville in Ohio. She is working on an album of songs inspired by the legends of King Arthur. And she is also an experienced performer, who has traveled around the world to compete in national and international competitions. But perhaps one of her most impressive accomplishments is just around the corner, as Ewell prepares to perform in New York City’s famed Lincoln Center as a finalist in the International Joy in Singing Competition. The final concert for the competition, which is open to the public, will take place April 25 in the Bruno Walter Auditorium at the Center’s New York City Public Library of Performing Arts. Ewell was selected as one of five singers for the competition, narrowed down from a group of nearly 150 singers who participated in the first round. She is competing for a grand prize package that includes $5,000, a debut recital at a New York concert venue, and 10 hours of recording time at a professional studio. “I’m very excited and I feel good about my performances so far,” said Ewell. As part of her semi-final concert in March, she performed a 20-minute program that included music telling the story of a day, from sunrise to sunset. She selected music to represent a variety of musical styles and languages, including Spanish, English, French, Italian, and an Incan language. Ewell said she drew on her experiences at Catholic University while she was putting together her program, choosing several pieces she had studied with vocal professors Sharon Christman and Rosemarie Houghton. She also included an original composition by clinical professor Joseph Santo, assistant dean for academics and graduate studies. Ewell plans on performing two more of Santo’s compositions during her finals performance. Today, Christman said she is moved and inspired by the success Ewell has found in her travels and performances around the world.